This bulletin comes with a Hammer health warning. Yes, my fellow Hammerites, just like the late and great Eddie Cochran, there seems to be no end to the Summer Chess Blues for our gallant boys. 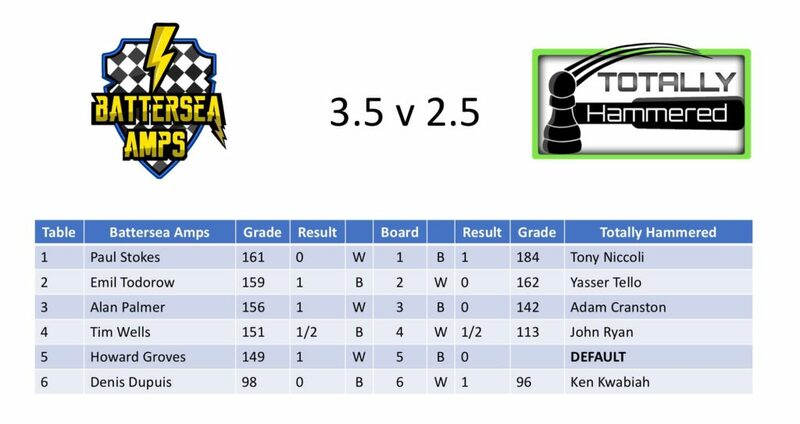 Our Summer teams both suffered narrow 3.5-2.5 point defeats in the penultimate round of the Summer Chess League this week. This was particularly harsh on our Totally Hammered boys, who had to concede a default on board 5. Furthermore, the pain was compounded by a touch and move error by Yasser in a winning position. Tony and Ken both had excellent wins. The Just Hammered team had one of those nights where the result could have gone either way. Marios, playing White, missed a win in a Bishop v Knight ending resulting from a Gruenfeld opening. Your correspondent, with the Black pieces, overlooked an intermezzo that would have provided a good edge in a Benoni/Kings Indian opening. Two draws on the board. Nadhmi had his worst game of the Summer League and Jay arrived late and flustered and hence did not give one of his best performances. We were now -2 and although David pulled off a smooth victory, Dipender was unlucky not to record a win which would have drawn the match. Sad to say both Totally and Just teams are now in full rehab and licking their wounds. With just one round to go in this inaugural season we occupy the bottom two places – not a pleasant sight of feeling. There is no other way to view it. However, the job of any Hammer reporter is to accentuate the positive and there is plenty to be positive about. We have blooded two new captains – both Marios and Ken have stepped up, giving them valuable experience for the 2017-18 League season. Many new members have played their first timed game over the board – proper competitive chess. This is something that is crucial and will stand Hammer in good stead for the coming season as well. 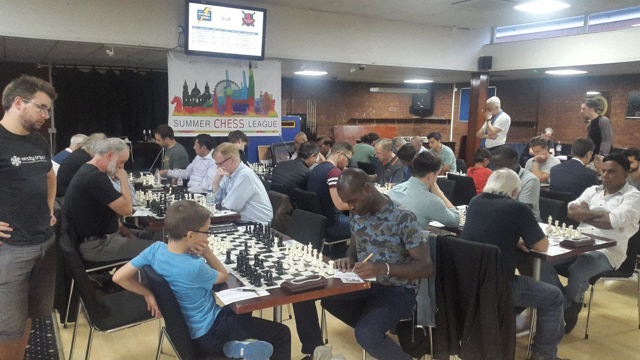 The Summer League has allowed us to make new friends and start something new in the London Chess scene. The fact that all games are played to a finish is great, with the use of digital clocks in the league clearly demonstrating the need for the club to invest in this technology. The introduction of the “Teamer” app – a bit of modern, smartphone technology helping our captains arrange a team with less fuss than a multitude of emails. There are many more positives to take from the first season of the SL and I know we will be better prepared next year. With regard to the night itself, the brightest ray of sunshine was that Adam’s game was selected as game of the week, and hence subjected to a forensic analysis by the Ginger GM, aka GM Simon Williams. The video is now available on the Summer League website, and the Ginger GM channel on YouTube. I have to say the fact that Adam played the London System, and that he introduced new ideas, makes the video compelling viewing (for the uninitiated, the GM is a huge proponent of the London System). This innovation in the Summer League is brilliant, and so educational. We are all grateful to Simon and Aldo who have really driven this. Hammer, the message is “keep the faith“. Continue to believe and we will get the positive results we deserve! !